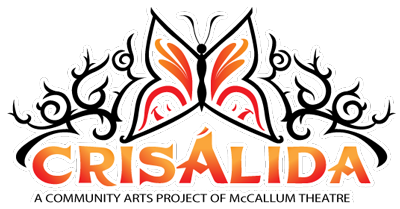 Crisálida: Community Arts Project | Crisalida Poets doing their thing! Crisalida Poets doing their thing! 23 May Crisalida Poets doing their thing! Maria Galaviz leading her poetry workshop with residents in the Mecca area. Writers young and old, novice and experienced, sharing a love of poetry in community. McCallum staff with our mobile Crisalida Art Van – we gave tours and a description of our activities. Crisalida Program Manager, Moises Huerta, addressing the McCallum staff. Local artist Carlos Galaviz (yes, Maria’s son) brought some of his work, including this huge colorful calavera. We also featured the work of Oscar Guevara, a brilliant local artist who will be offering workshops for us. Leonardo Espinosa, a retired farmworker and longtime associate of Cesar Chavez at the Las Casas housing project of the Coachalla Valley Housing Coalition, listening to the Praise Poem that Crisalida artist, Francisco Rodriguez wrote for him. Fransciso wrote a powerful poem that had the roomful of friends and family in deep silence, and not a few tears. Leonardo is in the center with the red shirt next to Minerva, the property manager, Joe Mota and Nicole Sanchez from CVHC are hiding in there somewhere too.